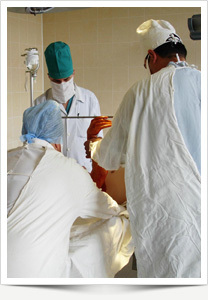 Surgery Pre & Post Op « Allentown Hypnosis – Hypnosis for Positive Results! Imagine you are calm and relaxed before surgery. You are confident and in control knowing that you have made the right decision for your wellbeing. You require less anesthesia, have very little blood loss; all of your systems are functioning 100%. You receive a lower amount of pain medicine then most people. Your doctor expresses how amazed he is at your progress and you have a positive outlook on your complete recovery. I used hypnosis for a bowel resection two years ago. I remember laying on the gurney joking with the nurses. I was so comfortable and relaxed. It was like I was at home instead of waiting for a major surgery to happen. As I was being taken down to the operating room I felt very peaceful and confident that I had made the right decision for my wellbeing. To this day I’m in awe at the amount calmness hypnosis brought to me. This was the first surgery I have ever had. “My neurosurgeon was stunned at how little medication I required before and after surgery, and how quickly I bounced back,” said Ms. Ritchie. Call now! 610.737.9560 and help your surgery go more smoothly and accelerate physical healing achieving a rapid recovery.